Treasurebobs Hide and Seek Game and Board Book | Hide and Seek fun for your little one! Who is hiding behind the bunting this time? The fun just goes on and on! 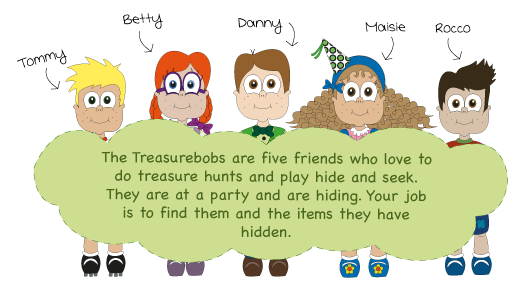 The Treasurebobs game is a simple hide and seek game. There are 12 pictures to hide for the ‘seekers’ and all your little ones need to do is find them and match them to the picture on the base board. There are even FREE downloadable clues for you to turn the game into a treasure hunt. This board book features the Treasurebobs characters who are hidden behind five party items. Here’s the great bit – you can change the hiding place of the Treasurebobs characters! With 120 different combinations, this colourful and engaging ‘lift the flap’ board book will keep your little ones entertained for ages!